Tuesday 27th May 2014 – 8.00pm – Murray MacGregor. A man who fell the best part of 40 feet down a near vertical slope has been lowered to safety through the combined efforts of ambulance and fire crews. The incident took place in Saltwells Nature Reserve in Brierley Hill at around 5.15pm on Tuesday evening. Initially a paramedic response vehicle, an ambulance and paramedic officer were sent to the scene, but they quickly requested assistance from the Hazardous Area Response Team and the Midlands Air Ambulance from Cosford with the MERIT trauma doctor on board. A West Midlands Ambulance Service spokesman said: “The patient, who was in his late teens or early 20s, had been with some friends at the top of the steep embankment when he slipped. “Although he apparently managed to keep his feet at the top, he tumbled a large part of the way down hitting a tree stump which left him with a deep ‘gouge’ in his thigh. He also had a sprained wrist. 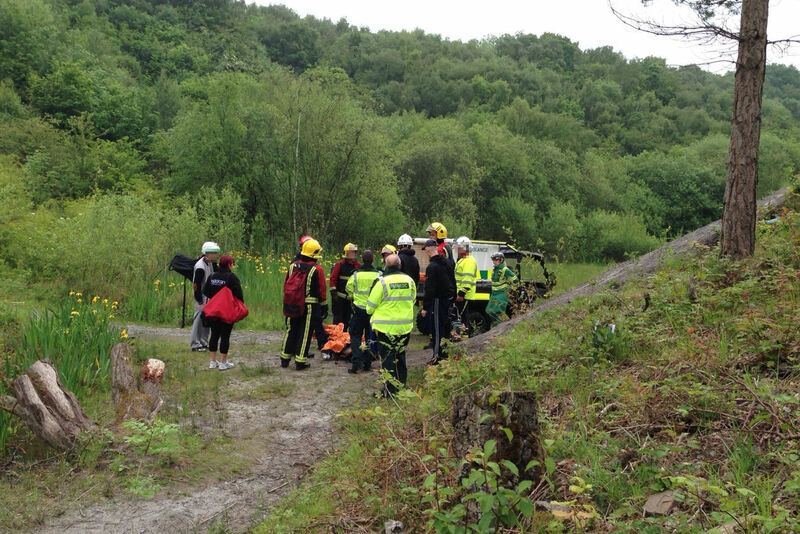 “Firefighters set up a rope from the top of the slope which allowed the specialist paramedics from the HART Team to lower themselves down to the patient. “His wound was dressed and was placed in a specialist stretcher before being lowered to the bottom of the slope. “While this was on-going, other members of the HART Team managed to find a way to get a Polaris 6×6 vehicle down to the bottom of the slope. “The man was then placed on the vehicle and driven almost half a mile back to the ambulance. He was then taken to Russells Hall Hospital. He is likely to need surgery for the wound.